Over the years, I have found that the BEST techniques to remove mouth odor during the day is to first, use gauze saturated with SUPREME BREATH™ Tru-ACTIVE ClO2 from the CONFIDENCE PUMP and second, rinse and gargle with the Tru-ACTIVE ClO2 mouthwash. The CONFIDENCE PUMP bottle is a unique spray bottle that is easily carried in a pocket or purse and dispenses both solutions of ClO2 at the same time to create Tru-ACTIVE ClO2. It can be used to saturate the gauze and as a mouthrinse. Simply spray enough solution to saturate the gauze and move it between the fingers for 30 seconds before using. Wait 1-2 minutes. Then aggressively scrub your tongue multiple times, using only one side of the gauze. For maximum results, repeat 2-3 times with different gauze. You can use it as often as you like during the day and it can be done at your desk or most other places and the gauze easily discarded. Remember that the scrubbing action removes more of the tongue biofilm. In addition, instead of mixing the solution in a separate container, you can easily use 6-8 sprays of the Confidence Pump Bottle in your mouth and swish it everywhere for 2 minutes (the number of sprays should be enough to amply swish and gargle with it).The swishing mixes the two solutions and the correct amount allows it to get into every area of the mouth and tongue.. These two techniques in combination have become the primary ones I recommend to people for daytime use in the Maintenance Program. Here is why: You eliminate more tongue coating, you use less product, it is easy to hide, do quickly, and dispose of. It is the best way to kill bacteria and remove the odor causing molecules. For best results, use the two techniques together. However, you may need more depending on your tongue coating and amount of gum problems. Here is a stronger rinse technique, the same one used in the morning and before bed protocols: place equal amounts of SUPREME BREATH Tru-ACTIVE ClO2 – 10ml of each solution in a cup, swirl for about five seconds in the cup, and swish after 2 minutes. The longer you wait, the stronger it gets. Use the amount that works for you, remembering that you want to get it into every area in your mouth and gargle with it. Moreover, if you have any sinus problems, allergies, or mucous, this renews the bacteria-killing action and neutralization of the odor-causing volatile sulfur compounds in the throat. If you have dry mouth, a mouth without adequate saliva, apply another dry mouth patch after lunch or use the Xylimelts wafers during the day. If the original is still working fine, then do this later. All people with sinus problems or suspected deficient saliva should lubricate with a dry mouth product so that you swallow more, and the stomach acid kills those bacteria and odor compounds. If you have sinus issues or allergies, gargle with the mouthrinse in addition to swishing with it. That may include adding an extra patch after lunch or adding Xylimelts during the day. If you have these conditions, I would also recommend use of a saline solution nasal spray when your nose is clogged. Two I particularly like are the Ocean brand and Nutri-Biotic Nasal Spray Plus. Ocean is a saline solution that simulates the flushing of the nasal passages. To do that during the day, I spray enough up one nostril so that it acts as a Neti-Pot but with less liquid. The Nutri-Biotic product, however, adds an extra antiseptic ingredient to be even more effective if you use it simply for a nasal spray. I do not use it for a nasal flush. You will not find me without one or the other during allergy season. If your allergies or sinus problems are particularly miserable, consider taking the Neti Pot with you to the office. It is not the most attractive thing to carry but it gets the job done. If you have food traps, find a product like the Dentek Floss Pick or some similar flossing device that you can put in a pocket to remove the food easily and quickly. And see your dentist to correct these food traps and open spaces. For gum disease alone, they are either beginning the disease process or making it worse. I know how difficult it is to follow a comprehensive regimen during the workday. However, the more you scrub your tongue, the more coating you remove. And, when you add the mouthrinse at the same time, you kill even more bacteria and odors. You cannot get immune to SUPREME BREATH™ Tru-ACTIVE ClO2 so use it as you wish. Next Steps: This depends on you. If you’re really serious about getting rid of your bad breath for good, request your in-office, professional treatment today. 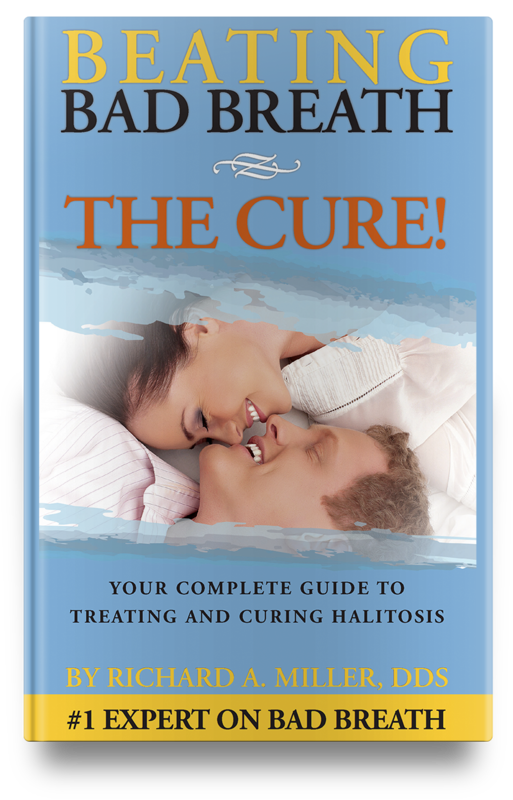 If you’re still unsure if this is the cure you’ve been looking for, learn more about Dr. Miller’s cure. Or, if you want to try Dr. Miller’s techniques at home, get the Supreme Breath Complete Bad Breath Elimination System and start feeling confident again.